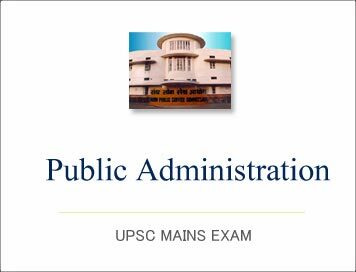 Public Administration Mains 2017 : Solved Paper Question Paper-2 (Question-1) | IAS EXAM PORTAL - India's Largest Community for UPSC Exam Aspirants. ANSWER : Constitution is descriptive of a complicated concept, deeply embedded in historical experience, which subjects the officials who exercise governmental power to the limitations of a higher law. Constitutionalism proclaims the desirability of the rule of law as opposed to rule by the arbitrary judgement or mere that of Public officials. Throughout the literature dealing with modern Public Law and the foundations of statecraft the central element of the concept of constitutionalism is that in political society government officials are not free to do anything they please in any manner they choose, they are bound to observe both the limitations on power and their procedures which are set out in the supreme, constitutional law of the community. It may therefore be said that the touchstone of constitutionalism is the concept of limited government under a higher law. Constitutionalism is the primary edifice on which the Indian democracy stands. The rule of law is the hallmark of our democracy, due to which every Indian feels empowered, making him or her participate in nation-building with full vigour and enthusiasm. As a result, the law that has emerged having been interpreted by the Constitution Bench of Indian Supreme Court navigates through diverse social, economic, political, cultural, historical and ethical moors. This has made the Constitution of India a living organic document keeping pace with the changing times. ANSWER :The cabinet secretariat, is supposed to act as a link between the prime minister and the central ministers and the chief ministers but also between the secretaries of the federal government and the chief secretaries of the states. Both of Cabinet Secretariat and PMO are headed by the Prime Minister, first one as the head of the cabinet and other one as the office of PM. Nehru was interested in having a powerful and professionally competent PMO to assist him and advise him in decision making and agreed to the persuasion that he should use the institution of the cabinet secretariat for this purpose and at the most the secretariat of the External affairs Ministry. Rajiv Gandhi reverted back to the path carved out by his mother by establishing the unquestioned authority of the PM over the cabinet and almost forced his will or decisions over his ministerial colleagues. It is not that the strong PMO always meant weak cabinet secretariat. Neither the time, nor the political circumstances supported Mr. V.P. Singh in developing his PMO. The same was true of the Deve Gowda and Gujral Governments. In these cases, there was an effective PMO, but not controversial. However, the importance of the Cabinet Secretariat was not restored. Mr. Narasimha Rao established a strong PMO as he settled down. ANSWER :The most unfortunate fact behind the inefficiency of local-self government institutions is hampered due to the lack of capacity building of the elected representative in India was because of lack of a comprehensive strategic framework towards capacity development. The experience in capacity building in relation to accelerated and sustainable development at the local government level should be located in a strategic framework to enhance the sustainability of capacity development and complement its success potential. 1) Staff development at local government and community level must be intensified. 2) Training in planning and management of local development must be hastened as this will form the basis upon which the local government human capacity will be strengthened. 3) Conducting of a staff audit as a first step with a view to determining areas where there is excess capacity and shortfalls which are to be addressed. 4) Carrying out recruitment of suitably qualified persons to improve the quality of staff available at local government level. 5) Capacities to capture the knowledge from past experiences and may opt to employ the services of external facilitators.